Inspired by @mike80's great DIY gel pad mat for $271, I thought I'd share my version which came to around $175 (with $32 of gel pad and some lumber left over) and requires no cutting away of mat padding with a special tool. I was motivated to try something different after owning a 3' x 5' Ultimate Matzilla Mat ($180) for 18 months, and it was 1) just a little too small; 2) was so thick and plush that my stance felt too squishy and my feet were making permanent indentations; and 3) the thick fibers grabbed the clubhead too aggressively, especially on slightly fat shots. Fairway woods in particular were difficult to pick cleanly from the mat without it slowing down the clubhead. I had some friends over recently for a round on TGC, and they were hitting everything about 3/4th as far as normal due to not picking the ball clean enough. I decided to try a far cheaper mat (see below) with only 3/8" nylon fibers, and all clubs skim through it like butter or a nice moist fairway. It has virtually no padding (5mm foam backing), so the gel pad is a must, and feels awesome under the hitting area. Fat shots are not nearly as much of a shock to the elbows, have better distance, but still give enough feedback that I don't think I'll have a problem of drilling myself steep. I've only been hitting on it for a day, but I seem to be getting a little higher average distance from all shots, especially my 3W. It's also better for putting in TGC, as the short nap is closer to green speed and the ball rolls truer than on the thick stuff. Haven't noticed any green marks on my clubs yet, either. I have no idea how long the mat or gel pad will last, but I'll update this post as the months go by. I'll be able to rotate the mat once, replace the gel pad once, and also move the SkyTrak around somewhat targeting maybe 4-6 different sections of the pad area. For now I'm quite satisfied with having a firm footing that doesn't leave indentations, along with a very forgiving hitting area. Put mat in position, and secure with a 1" wood screw at each corner and halfway points on long edges. Carpet tape is optional, but screws are easier to remove when it comes time to exchange pad or rotate mat. Excellent work and description. I can't wait to hear how it holds up and if you think your distances are close to IRL. Nice, this is exactly what I did with a synlawn remnant. So far it has worked pretty well but I will probably switch to synlawn's teestrike at some point. I didn't want to spend the extra cash until I tried this with the $50 remnant. Is your Synlawn piece the Precision Putt. How has it been holding up? Deadstick - how is your mat working out? Distances, wear, etc.? Love it. Better distances than the grabby Matzilla mat if hit slightly fat. Still plenty of feedback on slightly fat shots. No wear noticed yet. Very easy on the wrists and elbows. Looks great. I might copy this. Wonder if it wouldn't be a little better to actually make a 5x5 instead and make gel cutouts on each side but leave the cut piece in on all the sides you're not using the gel pad in. 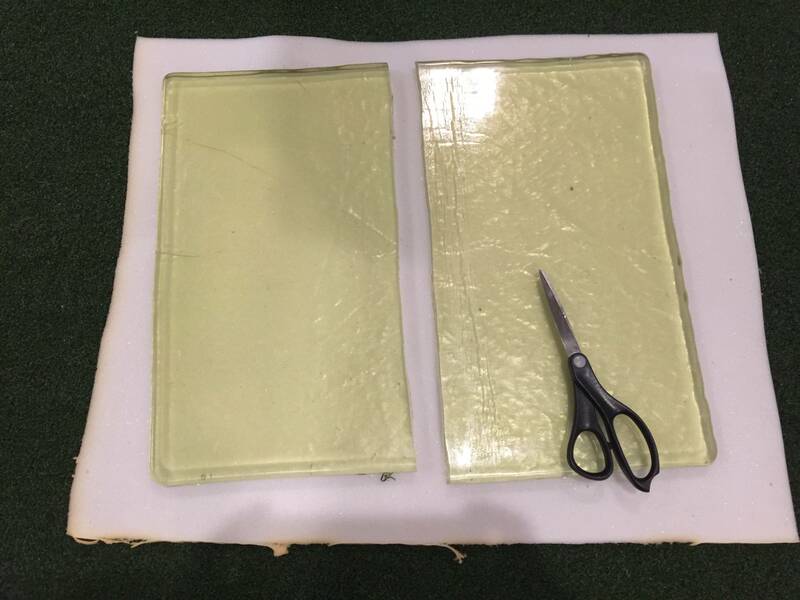 As your mat wears out at the hitting spot you would be able to just rotate the platform 90deg and move the gel pad to the new cut out. That'd get ya 4 diff spots to hit from on the mat. Just something to noodle on though. The 5x5 part I agree with - I went with 4x5 because I had the piece of 4x8 plywood already. Finding 5' wide lumber might be tricky, haven't looked. But mainly, cutting out those rectangles is a pain. It's fairly trivial to just remove handful of screws holding down the mat and rotate that when one side wears out. Could even re-use the screw holes by probing with an awl or icepick or something. Question for you DeadStick, did you attach the gel to the mat? 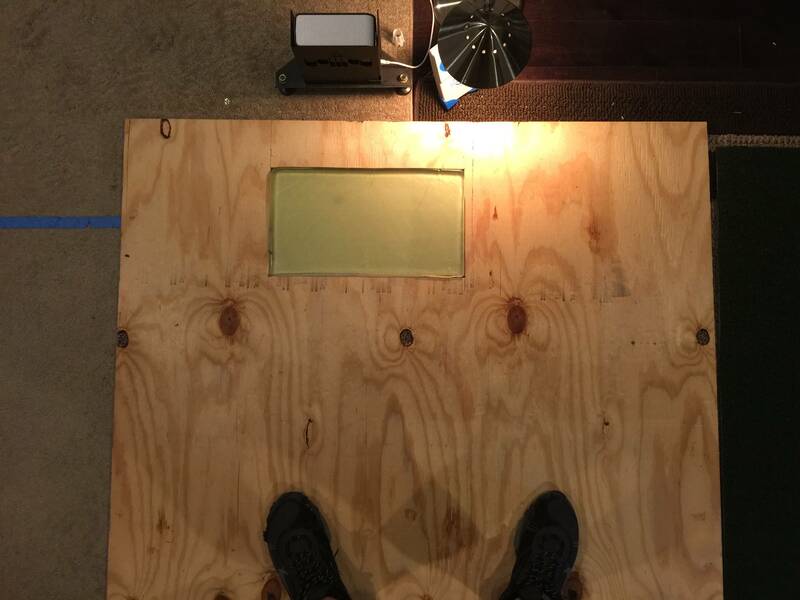 I see how you attached the plywood to the mat. I'm planning to do the same set up but will need to move it in my garage when I'm not using it. I don't want the gel to drop out of the bottom every time I move it. Thanks for sharing your idea. No, but it's easy to lift the edge of the mat away from the plywood and pull the gel pad out before moving it. Or you could duct tape the bottom of it so it wouldn't drop out. How does the gel feel if you were to stand on it. I ask because I am going to be building my sim soon and I'll have to make a hitting platform for a lefty and righty so I will need to put two gel pads in and depending on measurements the gel hitting area for the lefty will likely be in the stance of the righty. I don't have enough width to keep the gel in one place so the hitting areas will be offset. The gel area is super squishy when you stand on it - you wouldn't want your stance on it. Doh, I was hoping that wasn't the case. I was planning on doing a 5x5 mat, hopefully a 6x4 can work depending on foot placement. I'll have to get the blue tape out and mark out the dimensions to see where foot placement will be. How's your mat holding up? Holding up great! Still love it. I think I may go this route. What do you do for teeing up a driver etc? do you just poke a hole through the turf and use regular wood tees? I'm definitely building this out for my sim build I just started. I have some Synlawn Precision Putt remnant that I am going to use. I have one roll that is 15'x 6' and another that is 15' x 3'. 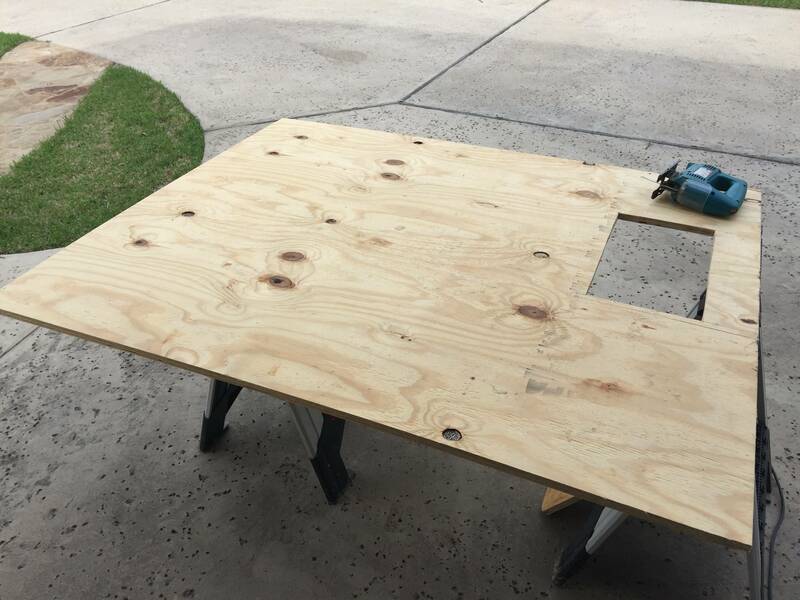 My plan is to lay four 4x8 pieces of plywood side by side giving my an 8' x 16' base to lay the Synlawn on, secure it with screws around the edges, cut some holes for putting, and a cutout for the gel insert. 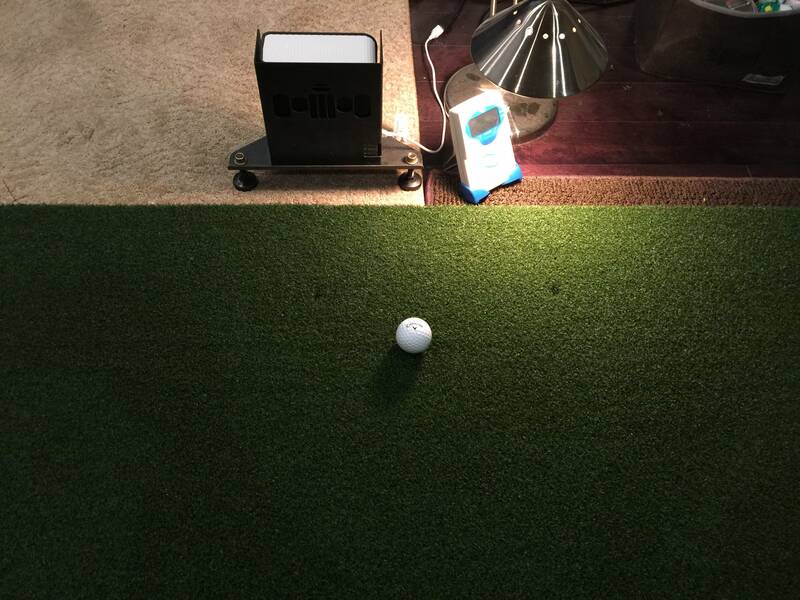 This would fill out most of my space and give my a nice indoor putting green to use as well. Glad I saw this thread! 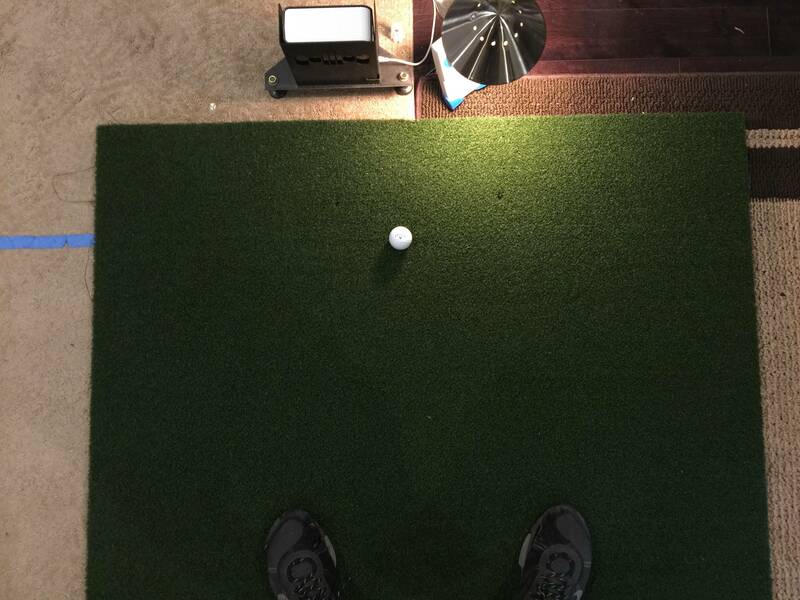 theizer Are you going to use the synlawn precision putt as your hitting surface with the gel underneath it? That's the plan. It seems pretty sturdy stuff. Has anyone else tried that? If it's able to withstand repeated hits without wearing out, that would be a great option. I don't know that I recall seeing anyone using the putting stuff as their hitting area. You may want to inquire with the manufacturer. In real life, I don't take much of a divot, so I think it should do pretty well. I figure if it wears enough that needs replacing, , I'll just cut and replace. I have a SynLawn store 5 mins from my house and they always have remnants. I also have a 3x4 piece of Classic Pitch I could use. I think Precision Putt on the gel should work great. It will be like a very nice fairway lie. Does anyone have a 1X2 piece of turf that would like to part with? I have around an extra 10'x1' of 2 different types of turf (no padding) for my DIY projects, but shipping is cost prohibitive.